Desperate to spot a hairy coo, Charles and I are up early this morning and, after the usual Full Scottish Breakfast (with some lovely blood sausages), we head out from our little B&B, The Glenartney, in Brodick, to cruise the emerald green pastures along the west coast of Arran where, Charles assures me, we will most definitely spot a hairy coo, an animal I’m starting to suspect might be as mythical as the unicorn. Holy Island is owned by Buddhist monks from Samye Ling. We hike through a damp field that faces Holy Island, a tiny isle that has been a Buddhist retreat since 1995, and end up near caves where, Charles says, Robert the Bruce hid out for three months after being defeated by the bloody English. The story goes that Robert the Bruce was so depressed over his thrashing by the Brits that he considered leaving Scotland and never coming back. But while hanging out in the damp cave, he took to watching a spider build a web across the cave’s entrance. The spider was knocked down from time to time but always went back to working on his web. Which convinced Robert the Bruce to not give up and in 1314, he defeated the British in the Battle of Bannockburn even though his men were outnumbered ten to one. Nice story and I greatly appreciate Charles telling it to me, but where the hell are the hairy coos? Later in the morning Charles stops the car suddenly next to a large open field that slopes gently down to the sea. Charles is absolutely certain he’s spotted a hairy coo. So we tramp through the grass, soaking our pants up to our knees, only to find a couple of regular old dairy cows. Charles takes it all in stride. 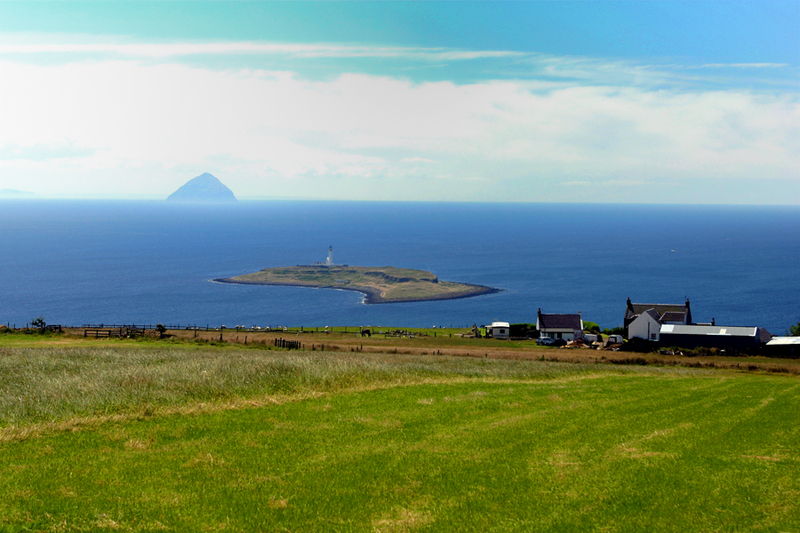 Pladda lighthouse and Ailsa Craig. But no hairy coos. Photos by David Lansing. “Glorious morning,” he chirps. Then, as if we weren’t looking for hairy coos at all but only a good view of the sea, he proceeds to go on and on about the two small isles directly in front of us. The first, a very small pear-shaped isle, with a lighthouse on the far end, is Pladda. Beyond that is Ailsa Craig, a thousand-foot tall plug of granite from an extinct volcano that was probably last active some 500 million years ago (or, as fundamentalist Christians prefer to think of it, around 1900). Indeed. But where are the hairy coos? Where are the Hairy coos? Beautiful scenery, I melt with envy. The suspense is killing me! Perhaps they only come to the sound of the pipes? Have faith, Fred. You know that sooner or later a hairy coo HAS to show up on the island. ‘ave you not seen the curiosity in coos perked by the pipes? A piper in a field soon will be surrounded by coos. I’ve often thought that the bag and its pipes looked a bit like an udder, and that the sound was a bit like a freshened coo and her bleating calf trying to find each other. Coos don’t know what to make of both together, and come for a look, I guess. Really. Well, Charles tried honking his horn incessantly in a search for coos but they didn’t take the bait. And haven’t come across any bagpipes (yet) on the island, though I’m sure they’re here. Hielan’ Coos don’t inhabit Arran. Enjoyed your photos – made me homesick – thinking of the holidays spent in Brodick and Whiting Bay. Thank you. 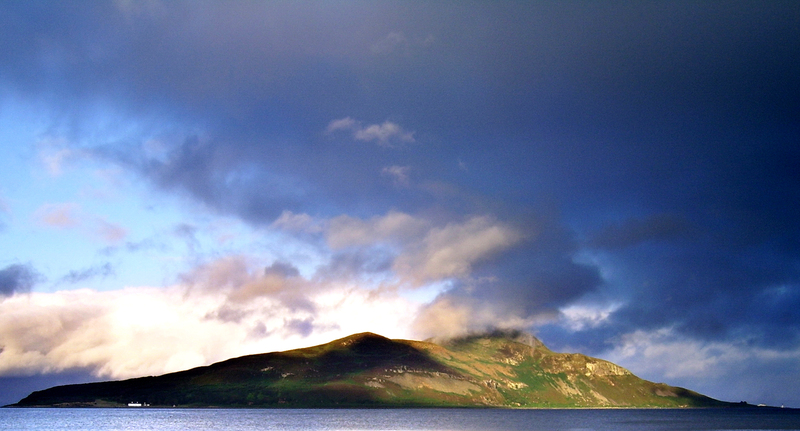 I love Holy Isle, and really appreciate the beauty of your top picture of it. May I use it as the cover photo for my facebook page?